Waynesville Middle School 6th graders are participating in a Citizen Science Project in cooperation with the WNC Nature Center. 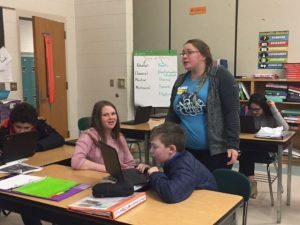 Staff member Tori Duval visited with each 6th grade science class last week to introduce the project. She gave students lots of information about the importance of citizens taking an active role in science and gave them some tools and apps to help them become scientists. Students discussed the possibility that they may be the next person to discover a new species right here in the mountains of North Carolina. Students will be using technology and other resources throughout the spring to document and report on populations of species right here in their own backyard.